With that out of the way, welcome to the fourth of our weekly Woodpecker bulletins. Once again, I shall update my progress of working through the training program advocated in The Woodpecker Method in preparation for the Batumi Olympiad, while inviting blog readers to share their progress and ask any questions they may have. The past seven days have not been the most productive for me in terms of training, as house-moving developments have taken much of my time and focus. I’ve now worked through a total of 678 exercises, which doesn’t sound so bad, but is an increase of just 72 over my total seven days ago. My average speed and accuracy for the Medium exercises has remained similar to before. Welcome to the third of our weekly Woodpecker bulletins, where I will continue to update my progress of working through the training program advocated in The Woodpecker Method in preparation for the Batumi Olympiad, while inviting blog readers to share their progress. In last Wednesday’s post, I noted that I had worked through the first 390 exercises in the book, of which 222 were Easy and the rest Medium. Seven days later, the total stands at 606, which means I have solved 216 Medium exercises over the past seven days: an average of almost 31 per day. I am satisfied with the total, which keeps me on schedule for my first training goal of 984 exercises within four weeks of my starting day. This past week was quite challenging as, in addition to the day job here at Quality Chess, I am preparing to sell my property and move to a bigger house, so all this has been taking a lot of my time and energy. My solution to this challenge is to prioritize my chess training in the early evening, and postpone any housework until afterwards when I’m tired, rather than the other way around. My usual daily goal has been 36 exercises in a session, or 24 if I’m tired and/or have little time available. (I find multiples of 12 to be logical as this corresponds with the layout of the book.) I managed either 36 or 24 every day with the exception of Monday, when I simply felt too tired to do anything in the evening. I compensated by solving 24 positions on Tuesday morning before work and 36 in the evening to get back on track. Unfortunately I haven’t finished checking my solutions and adding up the times, but my accuracy for the five days from Wednesday through to Sunday was around 92-93%, and my average time was about one-and-a-quarter minutes per Medium exercise – although obviously the solving time for any single position varies wildly, from a second or two when the idea instantly comes to me, to five minutes or more when I have to set up the position on the board and look harder. Jacob’s academy on Crete in November now has a live website with the possibility of registration. At the moment the camp is sponsored by American Chess Magazine and Quality Chess. It offers a chance to train with grandmasters Jacob Aagaard and Boris Gelfand at around €1000 for a week, all-inclusive, depending on which room and which view you are attracted to! With 400 meters of beach and good weather in November, this is your chance to get everything right! Yesterday the young Dutch player Lucas van Foreest finished on 7/9 in the Condigne Dutch Open. This was 1st equal on points, but GM Erwin l’Ami won on tiebreak. More significantly for Lucas, the score was enough for a final GM norm and gaining enough rating to push him over 2500. So that is the Grandmaster title at age 17. Congratulations! So what is the Quality Chess connection? Three years ago Lucas was the joint winner of the quiz we ran about the 2015 World Cup, winning 20 free Quality Chess books. 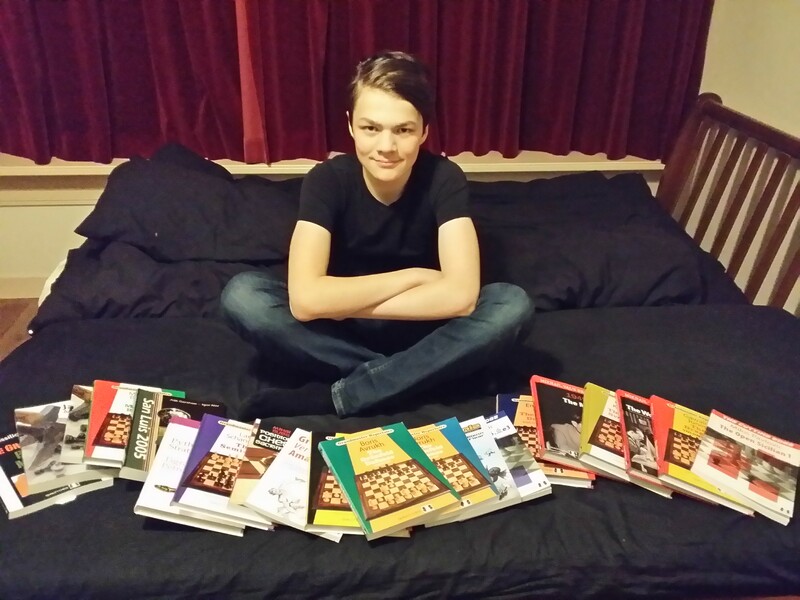 So that’s the secret – get 20 Quality Chess books, become a grandmaster. Sadly, that’s not quite the full story. Lucas is clearly a hardworking and talented young man from a famous chess-playing family. Older brother Jorden is a GM and rated well over 2600, while their family website tells me their great grandfather A.E. van Foreest was Dutch Champion three times. And that’s just to mention three members of the family: there are more chessplayers. New quiz question: name a more impressive chess family? Sam Shankland is of course the author of Small Steps to Giant Improvement. And also US Champion. 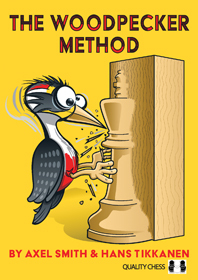 After last week’s blog post on The Woodpecker Method generated several responses and questions, we decided to make it a weekly feature, at least for every Wednesday between now and the Batumi Olympiad, which is the event I’m using the book/method to prepare for. I will document my progress in working through the exercises, and invite anyone else working with the book to do the same, as well as ask any questions about the book or the training method. Since last Wednesday I have worked through the first 390 exercises in the book. The 222 Easy ones were done in the first two sessions, but my pace has naturally dropped off since moving on to the Medium section. I am aiming for a fairly consistent routine of 36 exercises per daily session, or 24 on days when I am especially tired or pushed for time. This will keep me on track to finish the target set of 984 exercises (all Easy/Medium positions in the book) within the four-week period recommended by the authors. Please note that the 984 total exercises and 36/24 medium exercises per daily session are what I believe to be suitable for my own playing strength, ambition and lifestyle, and should not be taken as recommendations for all. I have also been keeping track of my scoring and number of minutes spent solving per session (not including time spent checking solutions and adding up my score, which I do separately afterwards). I don’t have the exact figures available as I write this, but I can recall that my total solving time over the past 7 days is a little under five hours and my overall accuracy has been something like 93%. This is not intended to open up a competition between myself and blog readers – only a competition with myself when I compare these results with future solving cycles. Summing up, I am happy with how the first week has gone, although the really hard work still lies ahead. So, over to you lot! Who else has been Woodpeckering this week?